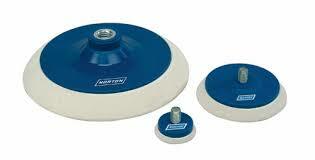 They are specially designed for microfinishing. They are also available in sizes of 33mm and 150mm in diameter. High quality Norton backup pads are manufactured from neoprene rubber for optimal pressure dissipation. The chamfered edges allow the pads to adhere to the contours of bodywork and reduce the risk of edge-cut.